I wasn’t sure what to call this recipe, as it is my own invention (yeah!). I have finally started to get accustomed to blending up tasty smoothies and/or bowls, so I have gotten adventurous in trying different ingredients. I usually eat these as a meal substitute for lunch, often after a light workout. 1. 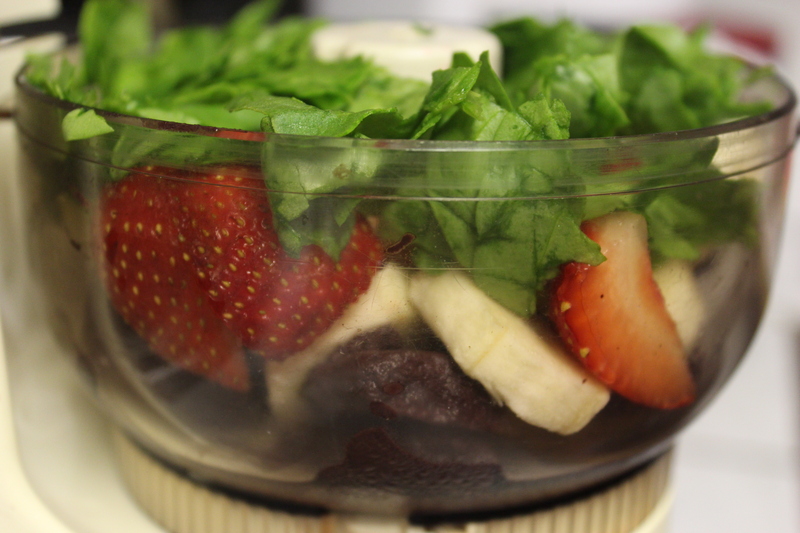 Add spinach, yogurt, blueberries, and almonds into a food processor. 2. Add an initial few pours of coconut milk and then add more as needed. 3. Blend away! This is when you add the additional coconut milk. 4. 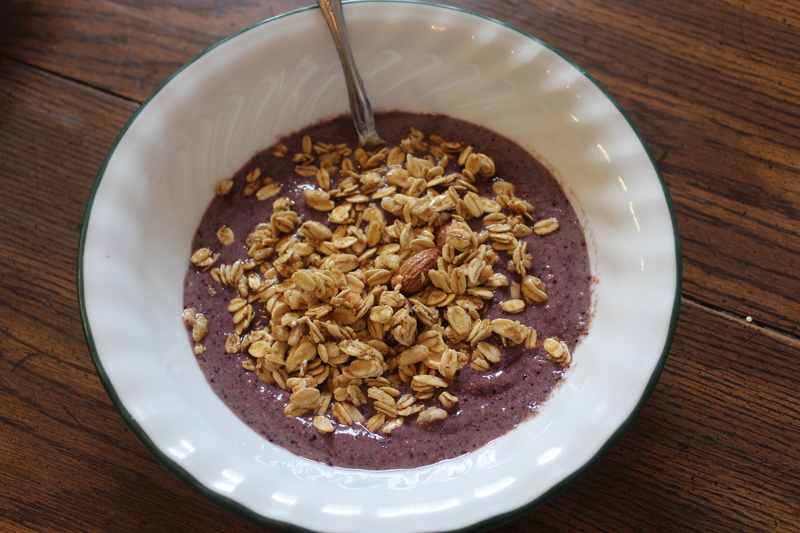 Pour contents into a small individual bowl and add the granola. 5. Eat and rejoice by how you can’t even tell you’re eating spinach! 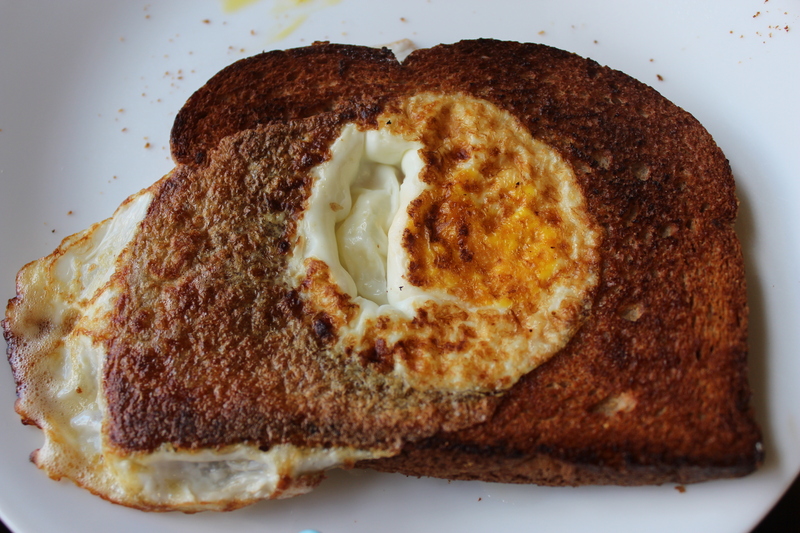 For a while, I have had the vision of eating a piece of toast with the egg inside. I googled it and I discovered that this was, in fact, a thing that people do for a quick and filling breakfast. Egg in a basket. Egg in a blanket. Toad in the hole. Eggs with hats. Sunshine toast. Whatever you call it, they are all the same! I decided to try a healthier twist on the recipes I found by toasting the bread first instead of frying the toast with butter in the pan. Of course, it’s completely up to you on how you prepare this delightful 170-calorie treat! 1. Put your bread in the toaster to a light-medium toast. 2. 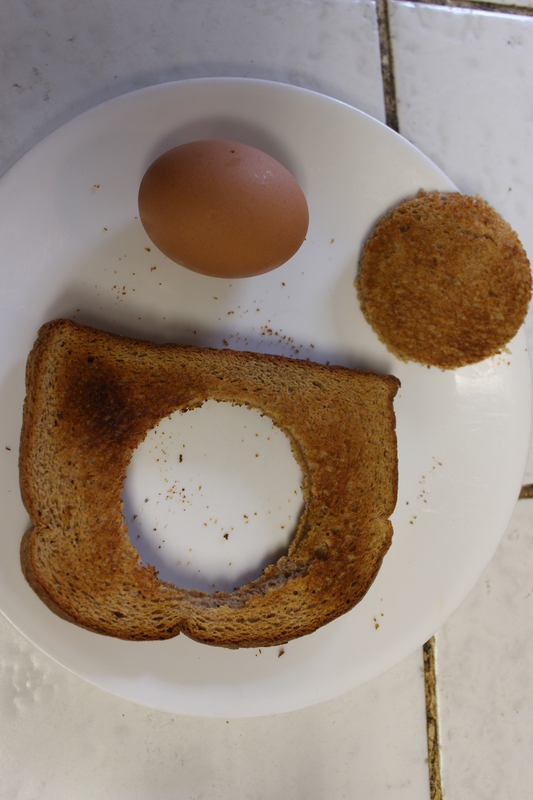 Use the cup to punch out a circular-shaped hole into the piece of toast. 3. Warm up a skillet on medium-high heat and lubricate with cooking spray. 3. Once heated, place hole-y toast into the skillet. 5. 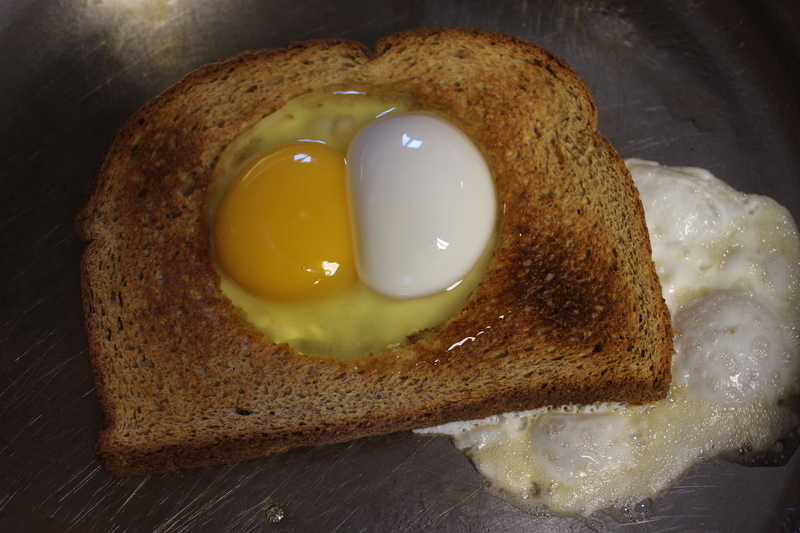 Allow the egg to cook enough so that it won’t get runny and fall apart when you flip it. 6. Once firm, flip it and allow the other side time to cook. 7. There you have it: egg in a basket! As you can see, mine didn’t turn out beautifully because I toasted it for a little bit too long at the beginning and the whites bled out a little. That being said, it tasted absolutely delicious and left me feeling full for hours after! I tried to take a picture of my feet on the scale with the number, but unfortunately my camera weighs about two pounds, so the picture wasn’t accurate. I have wanted to start consuming green smoothies as a way to get more vegetables in my diet for quite some time. Originally, I intended to wait it out until I got a Vitamix. However, given that I don’t have a job yet to finance said power blender, I whipped out my mom’s old food processor. It’s old as in she and my dad received it as a wedding gift. To my surprise, it did a fantastic job of pulverizing the spinach! 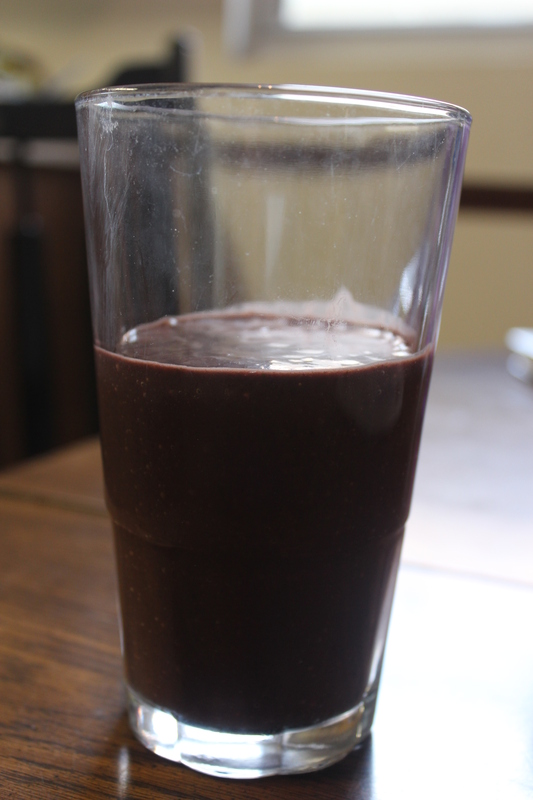 If you’re curious about green smoothies and haven’t tried out out yet, then make this smoothie! This smoothie has 150 calories and can easily be a breakfast meal replacement. 1. First, you need to start with preparing your ingredients (see above). 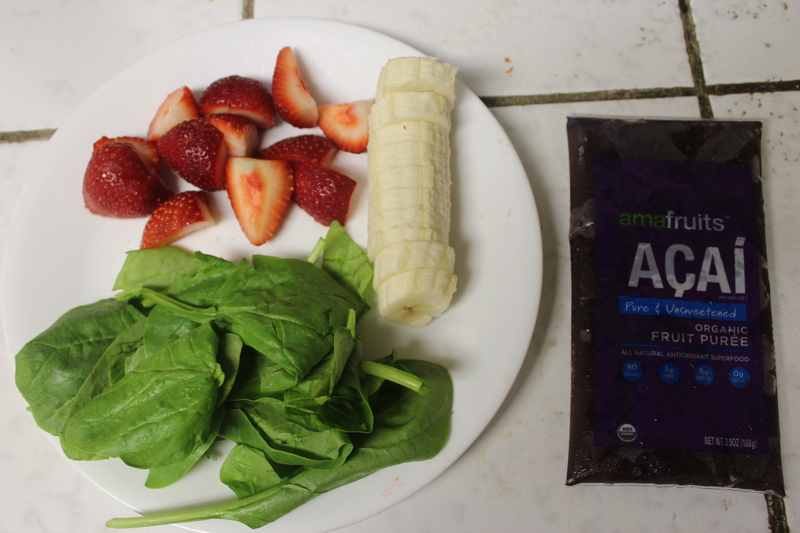 I used an acai puree packet, half a banana, six strawberries, and about 3/4 cup of spinach. 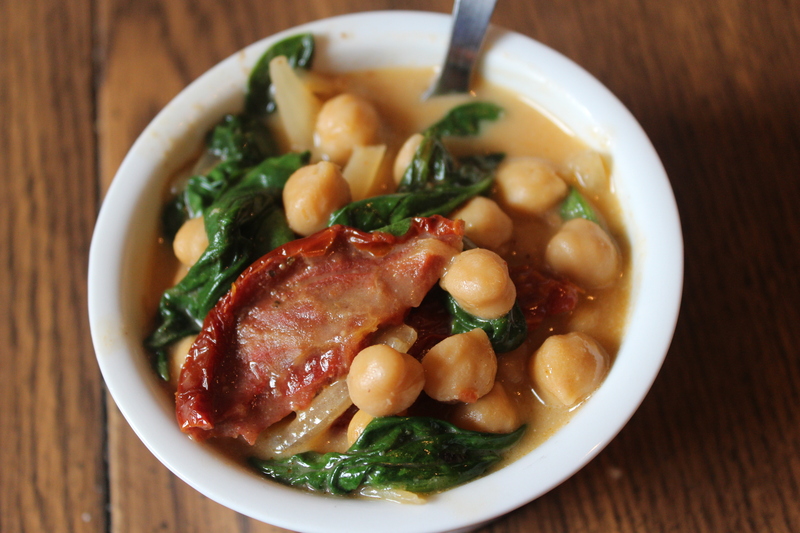 If you want to ease into the spinach, go for 1/2 cup. 2. Next, put everything into your blender/food processor/whatever you’re using. I also added a dash of almond milk to help everything blend together. If you have a more high powered machine than I do (you probably do), then it’s probably not necessary to do that. Press blend! 3. After you can see that everything is blended smoothly, pour your delicious drink into a cup and enjoy! As you can see, mine doesn’t look much like a “green” smoothie, but it still has a decent amount of spinach. The best part? I could barely taste the spinach! Do you have any favorite green smoothie recipes to share? Tell me in the comments! As a vegetarian who occasionally moonlights as a pescetarian, I have a surprisingly low appreciation for vegetables. Yes, I eat them every day. Yes, I often choke my way through them. Part of my mission in becoming a healthy person is to truly integrate vegetables into my regular diet. This means I need to eat many more servings. 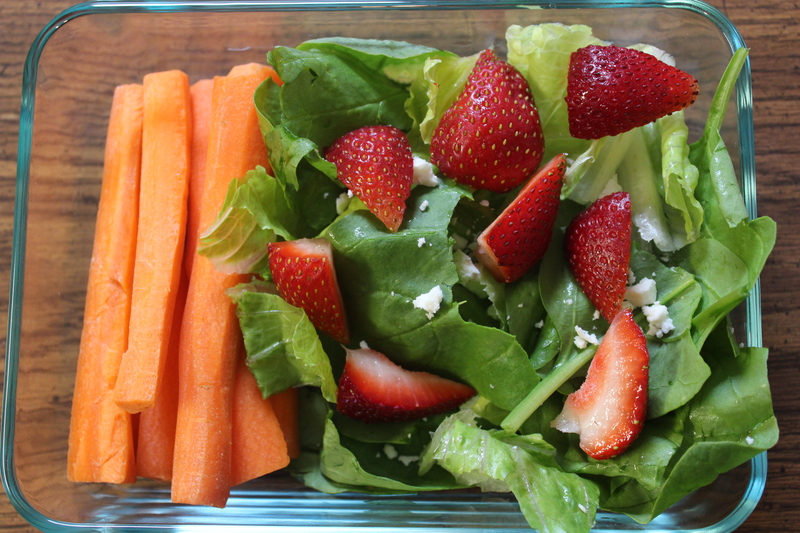 In fact, the USDA recommends between five and thirteen servings of vegetables per day. I know I don’t get remotely enough of that into my 112-pound body every day. What do you do to motivate yourself to eat veggies? What’s your favorite way to prepare them? Does this look good to you? If so, I’m going to tell you exactly how to make it! I found this amazing recipe here on treehugger.com. I adapted the recipe below to my own tastes, which I recommend you do, as well! 1. Heat the oil in a pot on medium-high heat. 2. Add the onion and cook for five minutes, or until slightly browned. 3. Add garlic, sun-dried tomatoes, and red pepper. Cook for three minutes and stir frequently. 4. Add chickpeas and cook on high heat until chickpeas start to golden and are covered in the mixture. 5. Add spinach one handful at a time while stirring constantly. Wait for it to wilt until adding more incrementally. 6. Pour in coconut milk and add in salt, ground ginger, and lemon juice. 7. Bring to a simmer and cook for ten minutes more, being sure the chickpeas are sufficiently warmed. 8. Feel free to taste the coconut milk mixture and add more of any ingredient (namely, salt and lemon) to your preference. 1. Rinse celery first, which is especially important if you buy organic like I do (there were even two tiny spiders in the heart of one of my stalks). I also highly recommend soaking them if you have the time. 2. Cut off the tops and bottoms. Throw away the leafy stalks. 3. 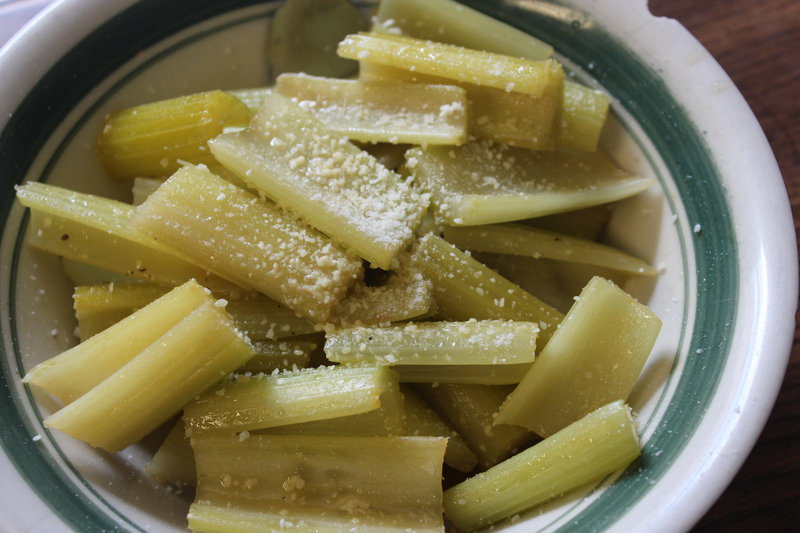 Cut the celery into two-inch pieces. 4. Melt butter in a skillet on medium heat. 5. Add celery, salt, and pepper. 6. Cook until the celery softens slightly (this should take about five minutes, but it also depends on the power of your stove). 7. Add broth (I used vegetable broth), reduce heat to low, and cover. 8. Cook until the celery is tender (also about five minutes). 9. Uncover and cook for another five minutes or until most of the liquid is gone. 10. Sprinkle grated Parmesan cheese on top and enjoy! The verdict: Give this to people who think they don’t like celery. If properly cooked, I promise just about everyone will enjoy this preparation of this low calorie vegetable. I wouldn’t recommend trying to make a meal out of this; one serving is, at most, 70 calories!